It should not have been a surprise, contrary to campaign promises, Richard Nixon escalated the war in Vietnam and expanded it by bombing Laos and Cambodia to strike at communist sanctuaries(March 17, 1969). His reputation as a hardline anti -communist was well known, and ostensibly Vietnam was an extension of the larger battle against the expansionist policies of the Soviet Union. The new president believed that his secret bombing campaign would help bring the war to an earlier close. He would later write that no future wars would be fought with restrictions and that would insure American victory. Those restrictions applied to his choice of bombing targets when exposed to the public exacted significant protests. President Nixon was a pragmatic and complex leader. On the one hand, he expanded the activities of the FBI from law enforcement to also include the collection of intelligence, and encouraged covert activities in the U.S. intelligence community. On the other hand, he sought to stabilize relations with the Soviet Union. His point man in that effort was his National Security adviser, Henry Kissinger. In this respect, the Nixon administration was cognizant that the more conservative side of his base felt that negotiation with the "enemy" was unacceptable. After all, Nixon had "made his bones" as Eisenhower's vice president in the famous kitchen debate with Khrushchev. Rhetorically, he would claim that he had met the enemy and he was victorious (July 24, 1959). His credentials as a cold war warrior began years before as a congressman investigating communist infiltration into the State Department. He was equally pugnacious when he won a senatorial campaign and accused his opponent, Helen Gahagen Douglas, of "pink right down to her underwear". Thus, in 1969, Nixon faced opposition on several fronts. There was an implacable enemy in North Vietnam, pressure from his right rejecting negotiations, protests from his left to end the war that were resonating with the public, and a belief that conventional and secretive outreach was necessary to conduct America's foreign policy. He began his first administration with news of border clashes between the Soviet Union and China (March 2, 1969). Blood was shed and relations were tattered adding to the history of Cold War conflicts. President Nixon viewing the split, albeit temporary, may have considered this as an opportunity to approach one side and thereby renew interest on the other side to also negotiate with the United States--"triangle diplomacy". On March 17, the president ordered bombing enemy sanctuaries in neutral Cambodia. This appears to have been a dual departure from a prior strategy. Not only had he extended the war into Cambodia, but also stressed an air campaign and a corresponding cut back in the ground war. This substitution of priorities had the consequence of diminishing the volume of the protest movement. A further indication of changed priorities was the institution of the Vietnamization policy that required that more of the ground combat be turned over to the regular army of South Vietnam (ARVN) as of July 25. Since the Sputnik era (October 4, 1957), every new advance in space had the effect of burnishing the credibility of communism or capitalism. Thus the news on July 20 of the American moon landing was evidence of the superior United States technology that was viewed by the world. Third World countries were always in play as part of cold war strategy. The Soviet's "iron curtain" was restricted to eastern Europe , but it did not prevent their presence in other parts of the world.Thus moving any non aligned developing nation into either the western or eastern column was deemed a victory. In Libya on September 1, The overthrow of the monarchy by the leftist Muammar al-Kaddafi was a coup for the Soviets in North Africa. He would rule for 42 years before he fell to a revolutionary movement on October 20, 2011. President Nixon announced a new world view on November 3, 1969. He acknowledged all treaty obligations, including a U.S. nuclear shield for allies, to continue to provide material aid, but no longer insert American troops in foreign actions to aid anti communist insurgencies. This policy rejected the Truman Containment Doctrine of 1947, and the Kennedy promise in his inaugural address: "to pay any price----bear any burden". Nixon began to implement his view when he began to withdraw U.S. troops and implement the policy of Vietnamization. Sometimes the Third World scale swung in favor of the United States, but more often then not, the world witnessed wide swings in events. In 1970, when the anti- communist Lon Nol took power in Cambodia, Nixon furnished aid in their fight against the Khmer Rouge. However, in December 1971, a revolutionary army gained control of Bangladesh (India-Pakistan war) and was immediately recognized by the Warsaw pact countries. In the middle east, in October 1973, Israel was attacked by Egypt and Syria in what is known as the Yom Kippur war. When Egypt accepted the U.S. peace plan, it signaled a shift in Egypt's cold war policy with a definitive nod toward the United States. In Chile, the socialist President Salvador Allende fell to an army coup led by Augusto Pinochet, a repressive dictator, who would be supported by the United States (November 11, 1973). Antipathy for the communist ideology, often resulted in American support for brutal dictators. On the African continent in 1974, the Haile Selassie reign ended in Ethiopia with the takeover by the Derg, hard line communist ideologists. There had been no diplomatic relations between China and the United States. Henry Kissinger looked for ways to meet with their leaders. A meeting was arranged on the ambassadorial level in Warsaw, Poland. The Chinese suggested adjourning the meeting to Beijing. Nixon was quick to respond. In March 1970, the president lifted most travel restrictions to China. One month later he asserted that it was time for the liberalization of trade with China. When the ARVN (Army of South Vietnam) invaded Cambodia to cut off and destroy North Vietnam forces on April 29, 1970, they were joined by American troops in May. There were two immediate results aside from the fact that the objective to destroy the NVA was not achieved. Factually, it was a colossal failure despite American ground and air support. Vietnamization was temporarily suspended, and China withdrew its invitation to President Nixon. The Nixon administration continued to work on several fronts. They were looking to get out of Vietnam "with honor" which meant pounding the enemy from the air to force them into reasonable negotiations and tacitly accepted that there would not be an American victory in Vietnam. 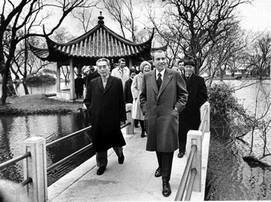 Nixon continued efforts in July 1971 to establish a relationship with China. Kissinger continued secret meetings with Chinese counterparts. An informal meeting in China led the Chinese to suggest that an American ping pong team play the the Chinese team in China. This reference to "ping pong" diplomacy was a small step toward normalizing relations. Indeed, small steps were valuable. On July 15, Nixon revealed that he had accepted an invitation to visit the Peoples Republic of China. This move was deeply disturbing to many Republicans. At the same time, Nixon moved to normalize relations with the Soviets in Berlin with a four power agreement on September 1, 1971. There were no significant results other than strengthening detente. Then on October 25, the United States approved admission of the Peoples Republic of China to the United Nations General Assembly. Moreover, America, by not exercising its veto power, now recognized Communist China as the legitimate government much to the disappointment of the U.S. ally on Taiwan. 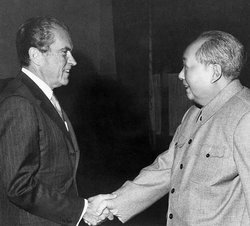 On February 21, 1972, Nixon began a week long trip to China which included a symbolic meeting with Mao Zedong at his home. Mao was the universal face of Marxist Communism. That meeting was followed with conferences with Premier Zhou Enlai the day to day leader of the Chinese government. The parties issued the "Shanghai Accords" which essentially eliminated Taiwan as a separate entity from the mainland. Once again the right wing of the Republican party was shocked. Beneath the new comity, Nixon had exacted a promise from China to aid in seeking a peaceful solution in Vietnam. By May 26, 1972, Nixon's "triangle diplomacy" bore fruit. (Detente with one country to influence a third country.) 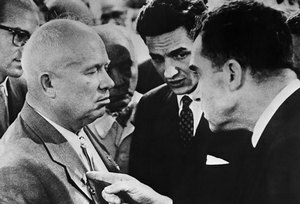 The United States and the Soviet Union agreed to limit development of costly anti ballistic missiles and offensive nuclear weapons. Salt I (Strategic Arms Limitations Talk) was scheduled to expire in 1977, but undoubtedly a start to ending the nuclear arms race.It also meant greater trade relations with the Soviets. There would be bumps in that road under the leadership of Ronald Reagan. The Nixon international successes were not having the desired effect on the North Vietnam ally. There should have been an awareness that North Vietnam was primarily an independent actor rather than a surrogate, or puppet, of Moscow or Beijing. As December 1972 closed an eventful year, President Nixon ordered a renewal of the heavy bombing of North Vietnam. In 1973, North Vietnam and the United States were back at the bargaining table in Paris. There had been secret meetings at the same table as far back as 1968 when the north sought the halt of United States bombing. The Americans had insisted on deescalation in the south. Result was an impasse that was repeated over the ensuing years until January 27, 1973, when the Paris Accords ended United States involvement in the war. The agreement was rejected by South Vietnam. The promises of the Accord produced duplicity on both sides. Although congress cut off aid for future bombing, Nixon secretly promised the south help with bombing, if necessary. During the height of the Watergate investigations, President Nixon and Henry Kissinger met with First Secretary Brezhnev in Moscow and Yalta. This one week in June 1974, produced no new initiatives, and this diversion from Nixon's woes did not distract the domestic audience from the scandal. President Nixon resigned. Vice President Gerald Ford was sworn in to office August 9, 1974. History reveals how the perception of the public of its presidents significantly was dependent on the trust that the president engendered. Eisenhower, Kennedy and Nixon each lied to the public with probable, significant military justification. Ike initially denied United States involvement with the U-2. Kennedy initially denied America's involvement in the Bay of Pigs Cuban invasion. Each got a pass from the American people. Nixon lied about his secret bombing of Cambodia and Laos by doctoring air force records to avoid anti war protests. When disclosed, the protests came from all sectors and the volume was deafening. 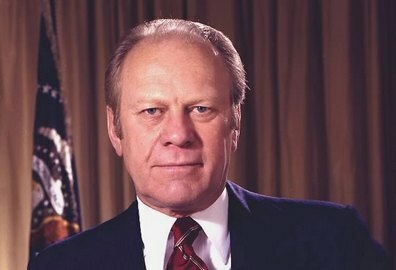 Gerald Ford was a respected congressman when he was selected by President Nixon to fill the vacant vice president position in 1973. The elected vice president, Spiro Agnew, had been convicted of bribery and income tax evasion. In 1974, he was again tapped as a replacement. This time to replace a president. Congress treated him as a substitute and refused to appropriate additional funds that Ford requested. Thus began a difficult presidency for Gerald Ford. One of his early acts was the controversial pardon of his predecessor, Richard Nixon. He also faced a diminished American influence in third world countries. The congress had also placed limitations on executive powers in the War Powers Act. Cypress is a large island country lying 50 miles off the Turkish coast. 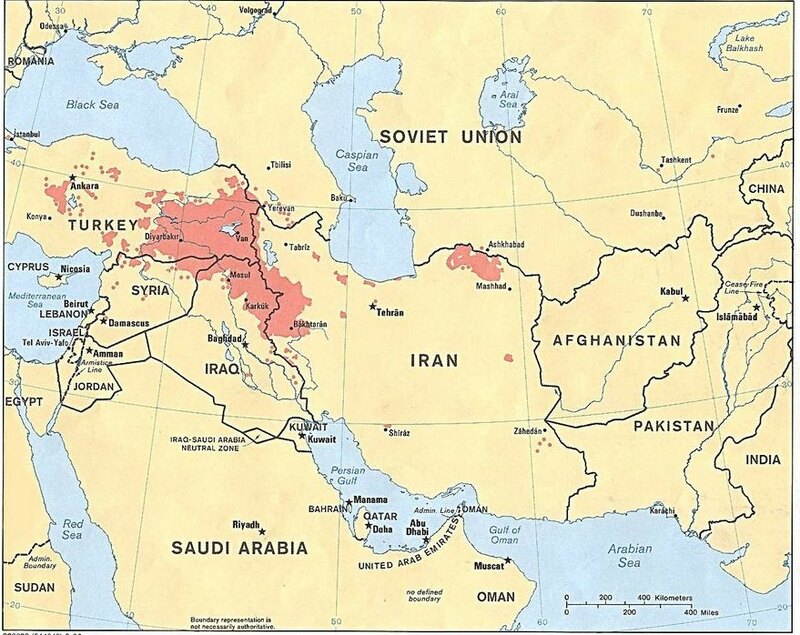 Turkey was a U.S. ally and a listening post for the CIA on neighboring Soviet Union. It also was a base for U.S. Jupiter missiles pointed at Moscow. The Cypress population was divided between Greeks and Turks with a preponderance of Greeks. Turkey believed it was their duty to protect the Turkish minority when a Greece inspired military coup took down the Makarios government. In June 1974, Turkey mounted an invasion on the island nation. Ford, with little foreign policy experience, desired to furnish the Turkish allies with military aid. The congress refused his request. Ultimately, Turkey and Greece agreed on a dividing line on Cypress separating the belligerent, diverse populations. On August 14, in what amounted to a meet and greet, President Ford met with Soviet Foreign Minister Anatoly Dobrynin. Ford had inherited the policies of Nixon ,and in the main, agreed with them. Although his personal predilection was for greater efforts to improve relations, his predecessor's policies had limited his actions. In the same month ending American involement in Indochina, Cambodia fell under the repressive and barbaric communist rule of the Khmer Rouge. The Khmer Rouge victory was capped by its capture of an American merchant ship, SS Mayaguez on May 12, 1975. 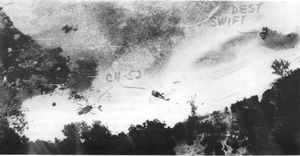 President Ford ordered an immediate rescue mission involving a carrier based air force and marines. 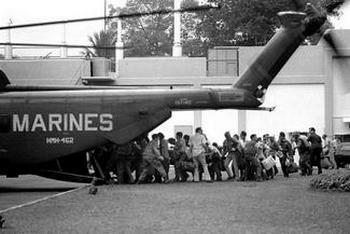 Additionally, a helicopter went down because of mechanical failure killing 23 service men. By November, there was a repeat of another communist victory in Laos under the Pathet Lao. The undeveloped nations in Africa were also falling to communist or Marxist liberation movements. Ethiopia fell and Angola was in the throes of a protracted civil war with cuban involvement..
With all the bad international news, President Ford was fortunate that the ground work of prior presidents with the Soviets and Chinese had stood the test of the American government's domestic, presidential problems. There does not appear that the changing of the guard at the White House resulted in any attempts to take advantage of Nixon's Watergate scandal. In July of 1975, the joint test flight of the Apollo-Soyuz cemented Soviet and United States space relations. August 1, 1975, President Ford took his first steps on the international stage.The meeting at Helsinki, Finland resulted in an agreement known as the Helsinki Accords. Factually it bound none of the 35 nations to a set of principles that tacitly recognized existing boundaries, but subject to change internally. However, it served as another step in easing tensions between the eastern and western blocs. 1976 was most significant because of the death of two Chinese leaders, Mao Zedong and Zhou Enlai. China was now in a struggle between those who desired to carry on the restrictive policies of the former leaders along the Soviet model of centralization, and the more liberal view of establishing a market based economy. The latter reforms established the path for China without any substantial political alterations. Ford had failed to establish a strong relationship with the American public. The Mayaguez incident had given him a slight jump in popularity, but it had no lasting effect. As a result, the presidential election went to a relative outsider, Jimmy Carter. Less than two months into the Carter presidency he addressed the United Nations General Assembly. He told the world leaders that human rights were the major priority of American foreign policy (March 17, 1977). That old policies such as containment were no longer viable. America would no longer support repressive pro western governments in the name of security. All activities of United States agencies would be limited by the Constitution. The Carter position was reiterated on June 6 referencing Soviet violations of human rights. "that land over there is yours and you will go back one day because your course is right and God is on your side". Thereafter, February 14, 1979, American ambassador to Afghanistan, Adolph Dubs, was shot and killed in an attempted kidnapping attempt. In September, President Turaki was assassinated and power grabbed by his second in command, Nur Mohammed Amin. Both the Soviets and the United States treated each side as their surrogates. Soviet aid crossed the border for their man in office along with thousands of Soviet advisers. Carter preferred secrecy with U.S. military materiel shipments to the Mujaheddin guerrillas. In July, Carter directed covert aid to the guerrillas. When the Soviet choice to lead Afghanistan rejected their control and was acting as a free agent, the Soviets wasted no time in responding. On December 24, the Soviets, having noted that their investment in a succession of governments was less than successful, they mounted a full invasion to control all aspects of Afghan society. Their special forces eliminated Amin. 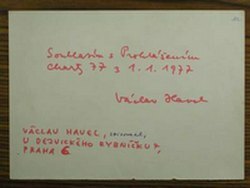 The Soviets then installed the USSR friendly Babrak Karmal as president. The Carter administration, with the prompting of Congressman Joe Wilson and like minded CIA agents, furnished additional and heavier weapons to the guerrillas. No longer were the conflicts with the United States limited to the delivery of resources to Afghans fighting Afghans, but an open confrontation between the forces they supported with the Soviet army.The Soviet Union was about to replay their version of an American Vietnam experience. Some have suggested that Afghanistan ended detente. President Carter was concerned that the Soviets ultimate intent was to keep pushing their power further south into Iran and its oil wealth and eastward into Pakistan and a warm water port on the Indian ocean. Carter then proclaimed that the United States would prohibit force to gain control of the Persian Gulf. History cannot overlook the concerns of the Soviet leaders that Islamic fundamentalism would spread across its borders and may have prompted their aggressive activities to their south. Years later that fear became a reality with between Russia and Chechnya. Despite the significance of Afghanistan and its role in the power struggle of the cold war, it was not center stage for the Carter administration. However, oil always had a starring role. On January 16, 1979, the Iranians deposed its Shah Pahlavi in favor of a fundamentalist Islamic state led by Ayatollah Khomeini. 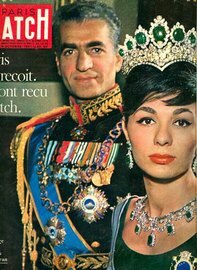 Pahlavi was granted asylum in the United States for medical treatment. In November, Iranian students, supporters of the revolution, forcibly took over the United States embassy, and held 90 American diplomats as hostages pending the return of the Shah to stand trial for crimes against the Iranians commited by Pahlavi's secret police. Carter refused and the hostages were held for 444 days. An attempted rescue effort failed with the death of 8 U.S. servicemen in an accidental helicopter crash. This failure would be a central issue leading to the election of Ronald Reagan in 1980. 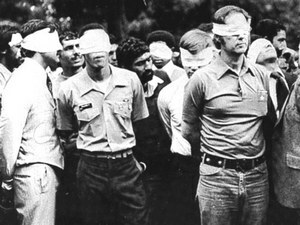 The hostages release had actually been negotiated by Carter, but their release coincided with the inauguration of Ronald Reagan in January 1981. Against the backdrop of Afghanistan, the Iranian Revolution, and a similar revolt in El Salvador by Marxists against a western leaning government (May 9), Carter and Brezhnev concluded the Salt Treaty II. This agreement limited the number of nuclear missile launchers in the U.S. and in the Soviet Union. The invasion of Afghanistan gave Carter pause regarding the trustworthiness of the Salt II partner. He threatened the Soviet's that their actions caused him to postpone ratification of the treaty in the U.S. Senate. The treaty was never ratified, but over the ensuing years a series of protocols maintained the essential elements of the agreement. 1979 would prove to be Carter's most problematic year in office. In addition to all of the negative news in this year, July 17 would create problems that would bedevil the succeeding administration for years. Pro Marxists, Sandinistas, overthrew the Nicaraguan dictator, Samoza who had been supported for years by the United States. The variety of problems in 1979 was staggering. Added was OPEC's decision to cap the world's oil supply. The increased price added to domestic woes for the electorate. A look back, however, many of those world problems were also negatively affecting the Soviet Union--much self inflicted. The strain on their economy, much below the strength of the United States, was seriously diminishing their ability to compete with the United States in the many cold war conflicts. The door was open for President Ronald Reagan to exacerbate the Soviet's problems. 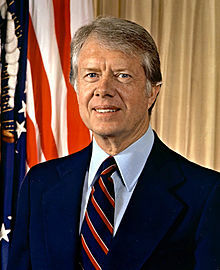 Carter's last year in office, 1980, acknowledged the 1979 death of detente when the president forbade the American Olympic team from participation in the Moscow summer games. Although early in the year (February 22), an American Olympic hockey team had defeated the highly regarded Soviet team at Lake Place,New York. The Cold War scorecard recorded wins and losses no matter how insignificant the event. Additionally, the Soviet Union received another jolt when the world learned of a workers strike in the Lenin Shipyards in Gdansk, Poland that resulted in granting the union rights independent of the Communist hierarchy.